To provide a forecast of oil prices, the time series (TS) covering the average prices of the Brent, Dubai, and West Texas Intermediate (WTI) oils in the months between January 1960 and 2017 is reviewed (see Appendix F). As Azeri Light oil from Azerbaijan has only a small time series, its prices are not included in the model. 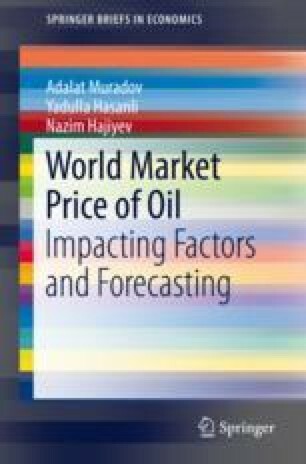 However, since the prices of Azeri Light oil in the world market are heavily dependent on the prices of other oils, its forecast prices have been predicted to build regression models that are dependent on the prices of other oils. It should be noted that the prices of Azeri Light oil in the world market are slightly higher than the prices of other oils.